Imagine you’ve just found out your six-year-old child needs surgery in a couple of weeks. Where do you begin? My First Surgery is now available on iTunes to help parents and patients better prepare for their first time in the operating room. Dr. Robert Baird, a practicing surgeon at the Montreal Children’s Hospital, saw a need for a communications tool that could help ease parents’ anxiety about the process. 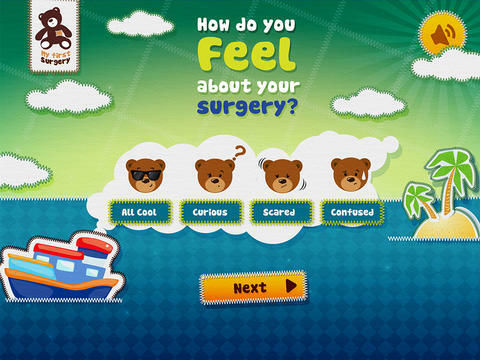 The interactive app breaks down each step by explaining what will happen before, during and after the surgery. Undergoing surgery is never easy for a child—or a parent– but this app will help make the entire process a little less scary. My First Surgery was the winner of the McGill University Centre for Biomedical Innovation mHealth App Creation Challenge. Designed locally, the app will be accessible internationally through iTunes. It is currently available in English, and the developers are seeking funding to translate the app into other languages. My First Surgery requires iOS 5.0 or later and is compatible with iPad. My first surgery is intended to be used by parents of pre-literate children under the age of 13 and in association with such children. Adult supervision of children under the age of 13’s use of the Program is recommended at all times. My First Surgery does not provide medical advice, diagnosis or treatment. Always seek the advice of your physician or other qualified health provider with any questions you may have regarding a medical condition. Never disregard professional medical advice or delay in seeking it because of something you have read or listened to on the My First Surgery mobile application. The developers take your and your child’s privacy very seriously – they do not collect or share information about you or your child, nor is there any third party advertising and they do not market to children. This entry was posted on Friday, October 25th, 2013 at 11:22 am and is filed under Digital Products, Education, Educational, Everyone, National News, New Releases. You can follow any responses to this entry through the RSS 2.0 feed. You can leave a response, or trackback from your own site.